Kodak has sold its image sensor business to Platinum Equity for an undisclosed sum of cash. The move brings the company one step closer to a cash goal it wants to achieve by the end of the year to appease investors and stay open for business. The once thriving photography company has fallen on hard times in recent years and remains unprofitable. 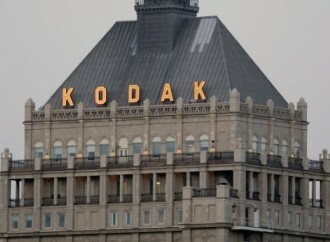 Kodak stopped manufacturing film cameras in the US, Canada and Western Europe in 2005 and has since shifted their focus to digital photography with limited success. 2009 was especially tough for the company as they posted a $137 million fourth-quarter loss, announced plans to cut 4,500 jobs, retired their Kodachrome color film line and sold their OLED business to LG. Selling their image sensor business is a last ditch attempt to stay afloat. According to The Wall Street Journal, Kodak is trying to get their printing business up and running before they run out of operating funds. Kodak officials warned that they will have trouble staying in business next year unless they are able to sell a key patent or raise money by selling debt. The image sensor business was part of Kodak’s digital camera line but it’s being reported that they will still have access to the equipment. In addition to the imaging technology, buyer Platinum Equity will also acquire a 263,000 square foot building in Rochester, NY that contains research and manufacturing products. Kodak shares jumped following the announcement and as of writing are valued at $1.20 each. Shares dipped as low as $0.78 in late September amidst bankruptcy talk.